Posted on Thursday, June 30th, 2011 at 12:47 pm. If you are looking for a quick way to help your students learn terms and definitions then you might want to try Quizlet, a web based Flash card tool and much more. 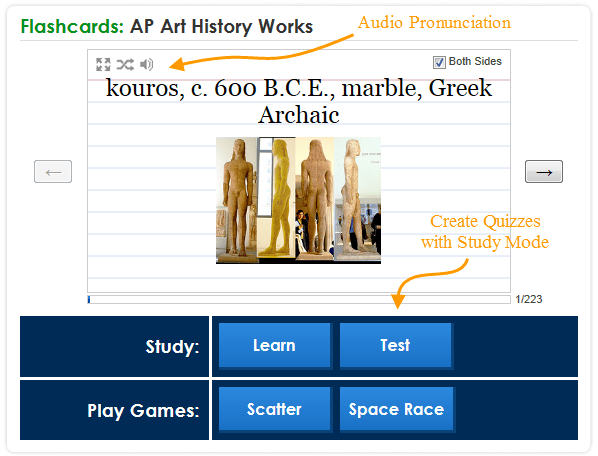 With a free account you can turn your list of vocabulary words or concepts into a set of flash cards. You can organize your flash card set into groups, and set privacy options. Quizlet has a study mode that will let turn your flash cards into random tests of written, matching, multiple choice, and true and false questions. Students can also choose to learn in game mode with Scatter and Space Race. Flash cards are accessible and printable. For Blackboard users you can choose to embed them within your course content. Quizlet is also mobile friendly and can work on smart phones and iPads. Learn more about Quizzlet, http://quizlet.com/learnmore/. This is a great reasourse!